The Hilton is located close to the airport and Cruise Ship terminal overlooking a marina. The hotel staff is very friendly and helpful. They assisted us with finding the most interesting tourist locations and arranging for a tour of the city as well as transportation. This is one of the best Hotels we have ever stayed at and we highly recommend it. The staff was very friendly and helpful. The bell staff helped us find points of interest and transportation to those locations. We loved our stay. Great location. Heater didn't work properly. I think there was mold in the air-ducts or too much cleanser sprays being used. My husband and daughter, plus myself had headaches and stuffy noses. Usually that is from mold or chemical sprays. The parking lot needs to be updated. Daily parking fee of $15.00-needs to update, wallpaper from the 70's. Good stay overall. Being that it was September, and not too warm, we didn't check out the pool. The staff was okay, the room was clean, the hotel was comfortable. Had to pay additional for parking. 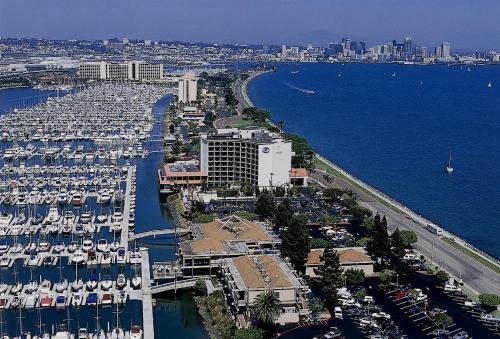 Overlooking the beautiful waterfront of Harbor Island, the Hilton San Diego Airport/Harbor Island offers everything a world-class hotel should offerconvenience, luxury, and flawless service. Lesiure and business travelers alike will be able to soak up the picturesque views of the Marina. 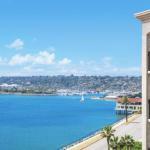 Its located only minutes away from the bustling downtown area and the San Diego International Airport. The resort-style hotel not only provides complimentary airport shuttle services, but also takes pride in its friendly service and convenient location. With easy access to public transportation and freeways, popular tourist destinations such as SeaWorld, Balboa Park, Coronado, La Jolla, the San Diego Zoo and San Diegos Gaslamp Quarter are only minutes away. You can be sure that there will never be a dull moment. If you are considering an extended stay and want to venture out of the city for day-trips, Orange County and the Los Angeles Metropolitan area are only a short ride away. The Hilton San Diego is an excellent choice for those seeking comfort and satisfaction. You can be sure to find all 211 guestrooms in pristine condition. Every room is impeccably furnished and comes with the following amenities: hair dryers, cable TV with movies on demand, high speed internet access, and 24-hour housekeeping. There are also different classes of rooms for your comfort and convenience. Guests of the Hilton San Diego Airport/Harbor Island can enjoy a variety of ways to spend their time at the hotel. You can take a dip at one of the heated outdoor pools, dine at the award-winning Sierra Pacific Restaurant and Lounge, or work up a sweat at the newly-renovated fitness center and sauna. In addition to that, you can find an ATM machine, florist, multi-lingual staff, gift shop, childrens activities, and a 24-hour fully-equipped business center. You can also stay connected with complimentary wireless internet in public spaces. The Hilton San Diego is a non-smoking zone, as per California regulations. And if only leisure is on the agenda, sip a glass of wine in the garden as you enjoy stunning views of the Pacific Ocean. I always associate the Hilton chain of hotels with quality service and excellence. And the Hilton San Diego Airport/Harbor Island is no different. I thoroughly enjoyed my stay here. On the star meter, it may not hit the 5 mark, but it is unparalleled in hospitality and range of amenities in its class. I loved its central location and my ability to access various tourist destinations with ease. If I needed a taxi, they would do it. If I wanted room service at 2 am, I would be eating by 2:15 am. If I wanted to know what to see and do for the day, I would have my entire day planned out within minutes, thanks to the knowledgeable and helpful staff. And the beautiful scenic views of the Pacific Ocean certainly added to my stay.